1900s- The population of Rwanda was about 85% Hutu, and the rest was Tutsi or Twa (History.com). The Tutsis were thought of as more superior by the belgians, and the Tutsis' trademark was longer, thinner noses, and they typically had more cattle. Some Hutus, or Hutu extremists were upset that a small percentage of the population was 'overruling them' (Stanton). This is the start of the tension that would lead to the genocide. 1973- Major General Juvenal Habyarimana was appointed the head power in Rwanda by a Hutu Military group. He was later made president by a revised constitution, and reelected twice. 1990- RPF (mainly Tutsi military) invaded Rwanda, and a ceasefire was called. 1993- President Habyarimana signed the Arusha Accord, which involved the RPF more in the government. This is the trigger that lead to extremist Hutus taking action. April, 1994- President Habyarimana's plane was shot down. As of now, no one knows who shot him down. Many think it might've been extremist Hutus so they could blame the Tutsis. 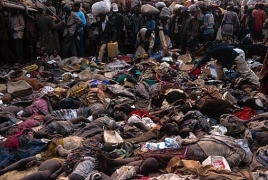 April, 1994- The same day that the plane was shot, and the news got out, opposing political people in charge were murdered, and a surge of people were sent out to begin the killing of Tutsis and moderate Hutus. Tutsis were not allowed to be buried. They were left where they were killed, in the streets, their houses, lawns. Everywhere. Please click on the photo to find its source. 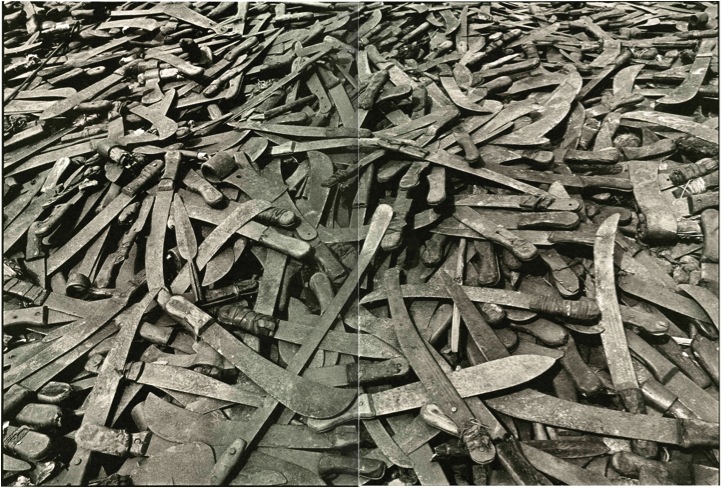 Machetes were the most common killing weapon as bullets were expensive. Please click on the photo to find its source. To find out more about what happened in the global community, check out out our page; Reactions to Rwanda, or to find out how it is now, check out our Current Conditions page!